Everything must start somewhere. And for Microsoft, it all really started with the Altair 8800. Altair 8800: Microsoft was formed soon after the introduction of the Micro Instrumentation and Telemetry Systems (MITS) Altair, the first “personal computer”, a build-it-yourself kit for hobbyists. 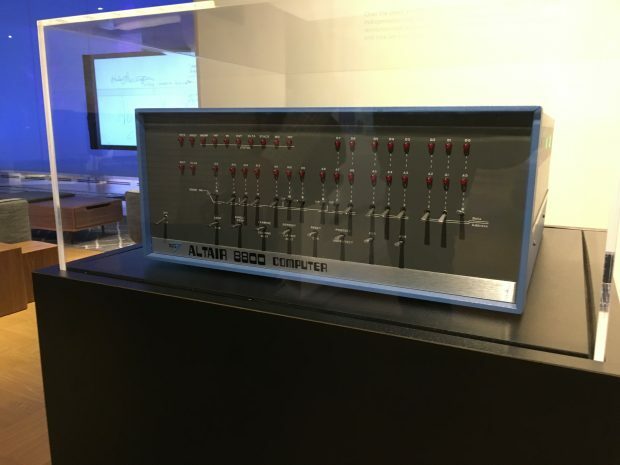 Bill Gates and Paul Allen seized the opportunity to transform this early PC into a breakthrough – the Altair needed software, a programming language that could make it perform useful computing tasks. That’s when it all began. Over the years the PC has transformed from a hobbyist’s toy to an indispensable tool that continues to change the world. It has revolutionized how we deal with information, how we communicate, and how we work, learn, and play. 1st Software & Code: Microsoft was founded on software for developers. 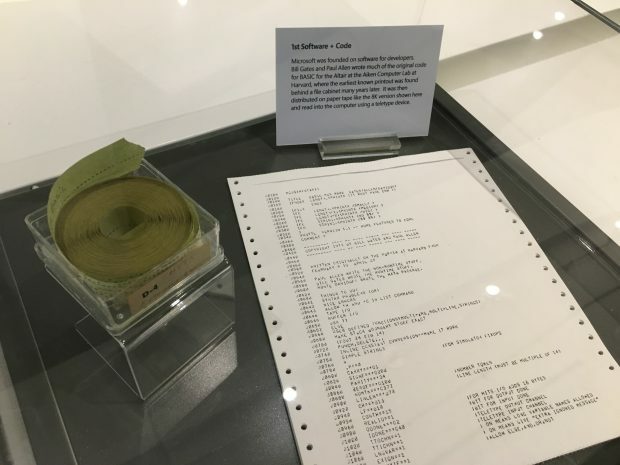 Bill Gates and Paul Allen wrote much of the original code for BASIC for the Altair at the Aiken Computer Lab at Harvard, where the earliest known printout was found behind a file cabinet many years later. It was then distributed on paper tape like the BK version shown here and into the computer using a teletype device. Business Cards: Have you ever heard Microsoft started in a garage? While fun for folklore, it’s simply not true. 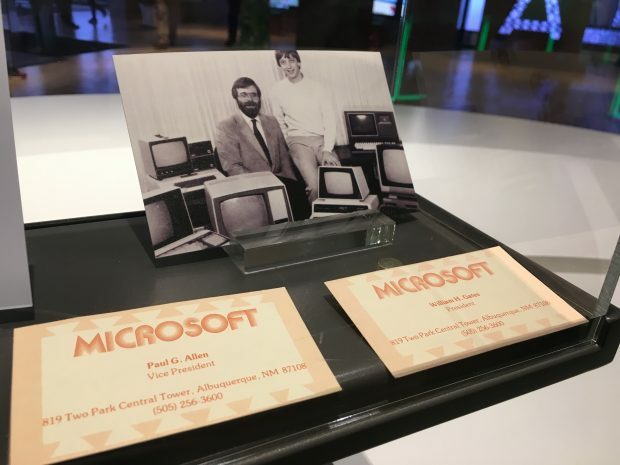 In fact, much of the early work of Microsoft happened in Paul Allen’s apartment in Albuquerque, NM, home of the MITS Altair computer. Visiting programmers, including Bill Gates, who was still a student at Harvard, often slept on the couch. These business cards are from Microsoft’s first official office, leased in 1976. So, if someone asks you where Microsoft started, a more accurate response is somewhere in between a Harvard dorm room and the American southwest. 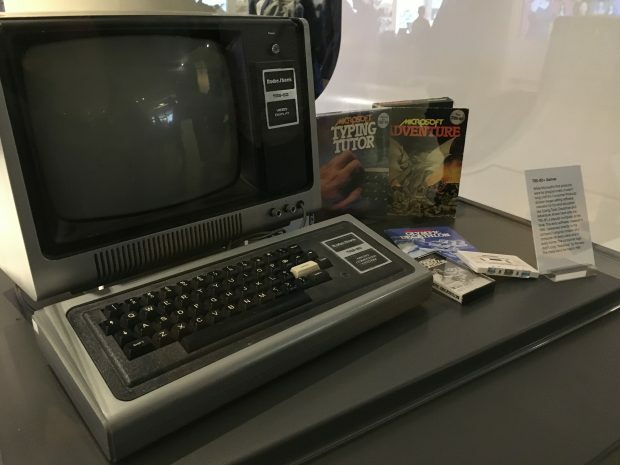 TRS-80+ Games: While Microsoft’s first products were for programmers, it wasn’t long until the Consumer Products division began selling software intended for fun and education, like Typing Tutor, Decathlon, and Adventure, shown here with the TRS-80, a popular computer at the time. This early software, released in 1980, connected directly to the company’s original mission of a computer on every desk and in every home. The consumer logo didn’t copy “Metallica” by the way. The metal band formed in 1981. 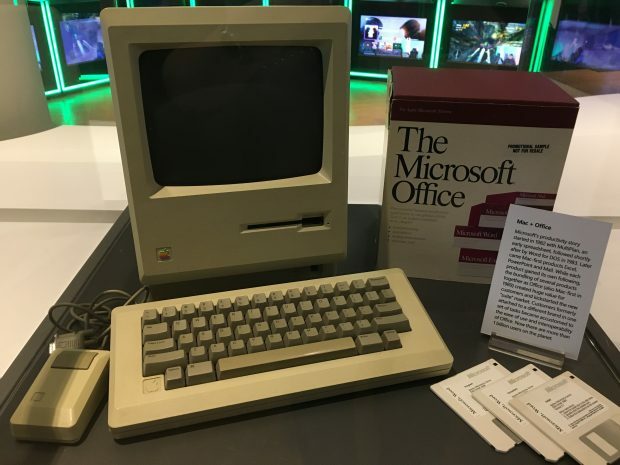 Mac & Office: Microsoft’s productivity story started in 1982 with MultiPlan, an early spreadsheet, followed shortly after by Word for DOS in 1983. Later came Mac-first products Excel, PowerPoint, and Mail. While each product gained its own following, the bundling of several products together as Office (also Mac-first in 1989) created huge value for customers and kickstarted the new “suite” market. Customers formerly attached to a different brand in one set of tasks became accustomed to the ease of use and interoperability of Office. now there are more than 1 billion users on the planet. Green-Eyed Mouse: The graphical user interface was a big step forward in making computers easier for humans to use, and Microsoft invested heavily in Windows and Mac software. But the new interfaces were awkward to use with just a keyboard – you needed a new way to make choices on screen. 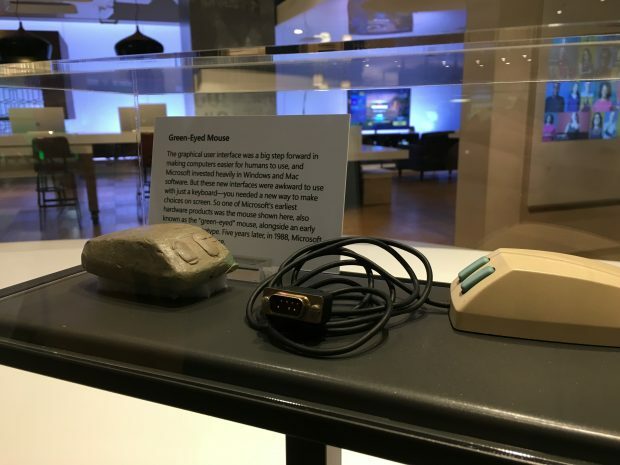 So one of Microsoft’s earliest hardware products was the mouse shown here, also known as the “green-eyed” mouse, alongside an early clay prototype. Campus: Microsoft is starting a major, multi-year expansion and renovation of its Redmond headquarters that will include 18 new building, 6.7 million square feet of modern workspace, $150 million in transportation infrastructure improvements, sports fields, and public and green space. As part of the project, several older buildings will be torn down, including the original buildings 1-4, which first opened in 1986. These were known for their peculiar “x-wing” design, intended to optimize the number of offices with natural light. 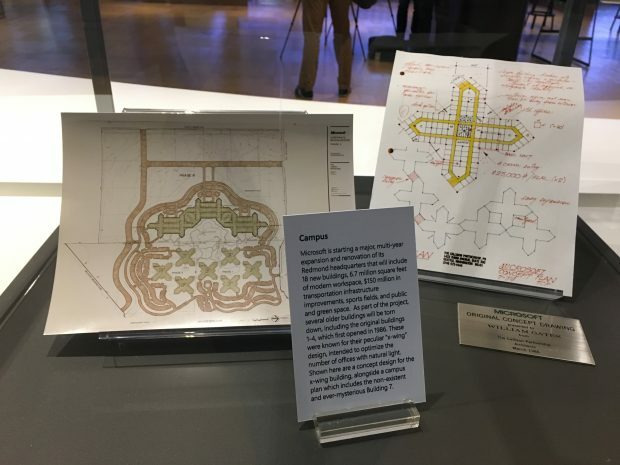 Shown here are a concept design for the x-wing building, alongside a campus plan which includes the non-existent and ever-mysterious Building 7. Plug & Play: Plug & Play allowed you to easily add peripherals like a mouse or a joystick. 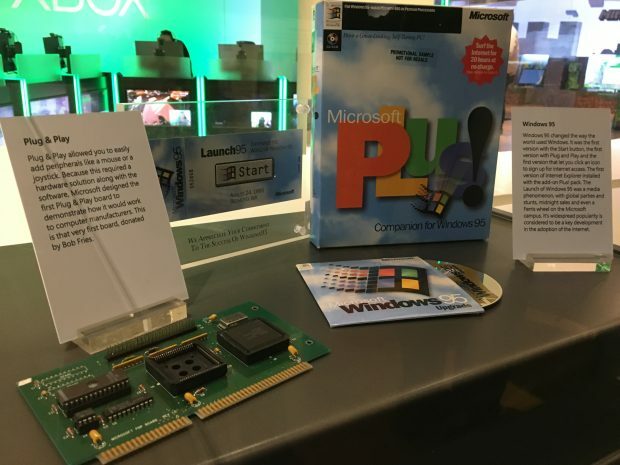 Because this required a hardware solution along with the software, Microsoft designed the first Plug & Play board to demonstrate how it would work to computer manufacturers. This is that very first board, donated by Bob Fries. Windows 95: Windows 95 changed the way the world used Windows. It was the first version with the Start button, the first version with Plug and Play, and the first version that let you click an icon to sign up for internet access. The first version of Internet Explorer installed with the add-on Plus! pack. The launch of Windows 95 was a media phenomenon, with global parties and stunts, midnight sales and even a Ferris wheel on the Microsoft campus. It’s widespread popularity is considered to be a key development in the adoption of the internet. 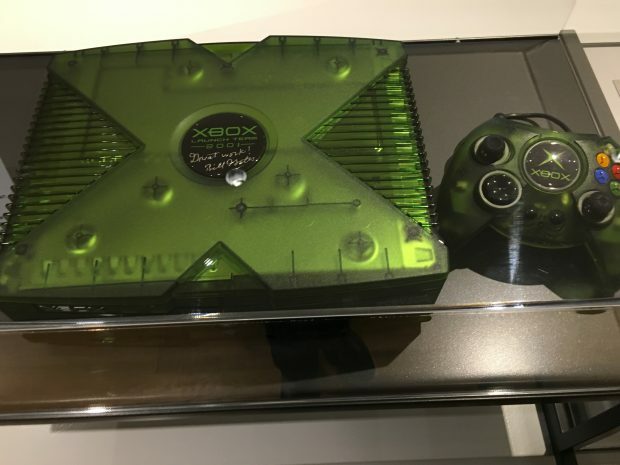 Xbox: The launch of Xbox in 2001 changed the gaming world forever. When first announced in early 2000, the mysterious chrome case, shown here, helped perpetuate the mystery and the buzz. “We wanted to convey the newness and excitement of Xbox, to let gamers know they will enter a new world,” proclaimed the press release. Xbox was envisioned as more than a gaming system, but rather an experience rooted in rich graphics. Now an ecosystem, grown beyond gaming alone, Xbox is a platform for education and entertainment. Also shown, the special employee launch edition console and “Duke” controller. 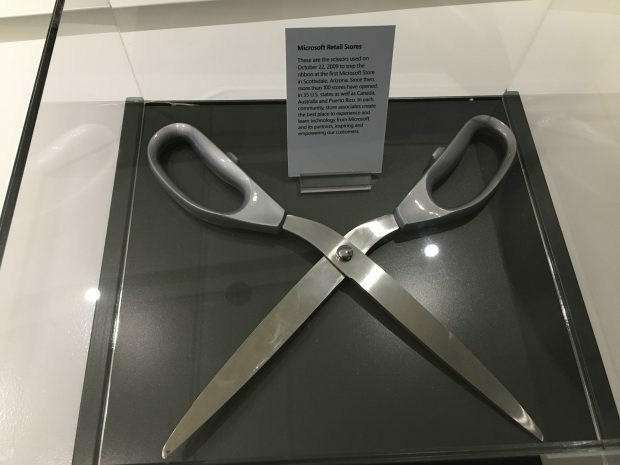 Microsoft Retail Stores: These are the scissors used on October 22, 2009 to snip the ribbon at the first Microsoft Store in Scottsdale, Arizona. Since then, more than 100 stores have opened, in 35 U.S. states as well as Canada, Australia, and Puerto Rico In each community, store associates create the best place to experience and learn technology from Microsoft and its partners, inspiring and empowering our customers.